Are you in favour of FOGL supporting the reintroduction of native animals on Boole Poole? Joe Stephens (Parks Vic) and Steven Coulson (Wildlife Unlimited) undertake recce to pinpoint the main watering points being used by feral pigs and to determine the areas of pig activity. Forty watering points were located and marked by GPS, these were in the form of waterholes both man made (dams), natural (soaks and wetlands) and holes excavated by kangaroos in their search for fresh water. Nineteen out of the forty watering points showed evidence of pig activity in the form of tracks, wallows or rooting. The majority of pig activity is located on the western end of Boole Poole with isolated activity on the eastern end typical of solitary animals or smaller groups. All information collected and stored on preliminary database prepared by Wildlife Unlimited. Steven Coulson (Wildlife Unlimited) with the assistance of Jim Bull (Metung) transports landcruiser 4WD across on barge to Mosquito Point on Boole Poole. Vehicle will be stationed alongside Parks Vic storage shed, Mosquito Point. Jim Reside and Steve Coulson (Wildlife Unlimited) undertake desktop research into relevant legislation and policies and codes of practice for the humane trapping and destruction of feral livestock. Attend a meeting with Joe Stephens (Parks Victoria) to discuss the permits and regulations. Joe commits to researching the relevant Parks Victoria legislation and policies. Joe also states that employees of Wildlife Unlimited will require Section 37 permits to carry and use firearms in lands managed by Parks Victoria. We contacted Sirtrack New Zealand about sourcing radio telemetry equipment. Found that collars are somewhat more expensive than first thought (over $400 ea) and the time from order to delivery is 4-6 weeks. Joe has indicated that Parks Victoria may be able to assist with the purchase of 2 collars. Steve continued the monitoring and recce of water points to ascertain areas of higher pig activity and locate possible free feeding points. Fresh sign was located around the 303 Paddock on Round Head track and the Point Jones walking track. 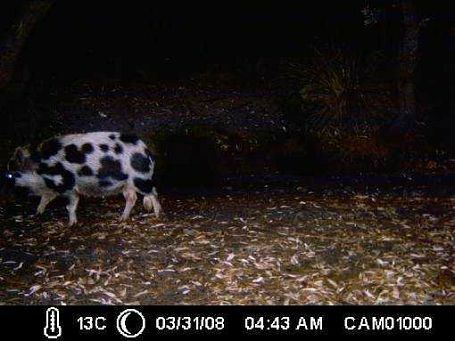 At the 303 Paddock Pig tracks were evident each morning around a freshwater watering point and it was estimated that between 3 and 6 animals may be present. At Round Head Track fresh rooting in moist soil thickly vegetated with Sarcocornia quinqueflora Beaded Glasswort was detected. It is possible/most likely that the same animals described above for the 303 Paddock are involved. 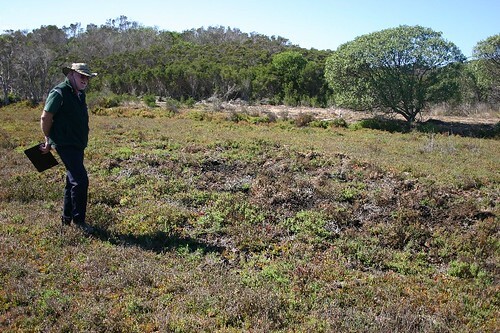 At Point Jones Walking Track fresh rooting in moist soil thickly vegetated with Sarcocornia quinqueflora Beaded Glasswort around the saltmarsh edge was evident and fresh tracks were observed following game trail, possibly 2 to 4 animals. Heavy overnight rain had inundated several low lying areas and Eastern banjo Frogs had started calling at one site. Instructions; Mix molasses and warm water until mixture becomes a smooth slurry and then gradually add oats until a nice “gluggy” consistency is achieved. This will take 2-3 days to ferment and will be ready for the commencement of free feeding next week. Froggie foam egg masses (Lymnodynastes species-Eastern Banjo Frogs have been calling) observed at sites 9, 16 & 17, 29 & 30. Sites 16 & 17 are along the Mahogany and Bunga Arm tracks. Large (>1m) long and very healthy Red-bellied Black Snake seen at site 24 (303 Park) and was possibly looking for a meal of frogs. Continued recce, multiple pig tracks along Jubilee Head Track. Steve checked pig traps contained in Parks Vic container to check for missing parts and any damage. Local people unsure of construction technique of traps stored in containers on Boole Poole so Steve contacts James Pardew (DSE Cann River) for advice. Steve recommends that Steve visits cann River to view firsthand the correct construction of pig traps and discuss trapping techniques. Steve continues the recce and monitoring of water points and feeding areas. Single set of large tracks along Yellow Bay Track at site 7 and 6 active sites with fresh sign in total. Noticed and recorded a large Black Snake feeding on Pobblebonk Frogs near a wetland. Steve set up 2 free feed stations, one on the corner of Jubilee Head track and Round Head track adjacent to a small fresh water watering point used by the pigs and the second within the park boundary adjacent to the 303 paddock also on Round Head track. A heavy piece of timber around 600mm long x 200mm wide is dug into the ground so that the upper surface of the timber is level with the ground surface The top of the “T”). A small vertical channel (Bottom of the “T”) is dug under the board forming a hidden trench. The trench is then filled with around 5 kilo’s of fermented oats. Liquid from the fermented oats mixture is then used to create a trail from game trail or water point to feeding station as a lure. This method allows pigs to access the bait by flipping the timber over with it’s snout The timber is too heavy for Hog Deer, Kangaroos or Wallabies. Steve set up a third free feed station on Point Jones walking track about 150m from Point Best track on Malalueca/Sarcocornia verge area adjacent to pig feeding area. Steve travels to Cann River to meet with James Pardew and Steve Lapidge from Department Sustainability and Environment feral animal programs. The aims of the visit were to discuss pig trapping methods and go through the routine of setting up a trap. Take blood and tissue samples from trapped animals to test for parasites and diseases and collect DNA material. DNA will help to identify origins of pigs and whether new animals have been released in more recent times. Checked free feeding stations but no evidence of pig or any other animals taking an interest in the bait stations as yet. Sign at Point Jones Walking Track in the form of rooting and tracks but no interest in the baiting sites. Sign of Hog Deer investigating the feed stations at the 303 paddock and Round Head Track but no sign of Pigs. Steve recommends a fourth feed station near McMahons Boundary where there has been sign of solitary pigs. Met up with the Parks Vic contractor doing the 1080 fox baiting. He has seen pigs in the past but a bit vague about precise locations. His boat was not tethered properly so Steve had to give him a ride to catch it up. DSE crews may have finished the slashing. Steve travels to Boole Poole to check free feed stations all stations were undisturbed. Set up two new free feeding stations under sarcocornia at known pig feeding areas at Round Head track and Point Jones walking track in an effort to get pigs to feed on oats while rooting up sarcocornia for the tubers beneath. Steve travels to Canberra to undertake animal handling training for Brush Tailed Rock Wallabies at Tidbinbilla Nature Reserve. Jim to Boole Poole to continue monitoring of free feed stations all stations were undisturbed. During his monitoring Jim runs into balloted Hog Deer hunters offering to swap information on where they have observed pigs for information on where the “big stags” have been seen. While visiting Tidbinbilla Nature Reserve Steve questions staff for tips on free feeding pigs, suggestions for other lures include- corn or maize, red cordial, fish sauce and watermelon. Steve travels to Boole Poole to monitor free feed stations, still no activity. Steve travels to Boole Poole to monitor free feed stations, still no activity with fermented oat lures. Tuna oil is added to several feed stations as an additional lure to attract pigs. Still no activity at feed stations including those with tuna oil lures added. Steve sets up additional free feed stations on Yellow Bay track, Round Head track, Point Best track, Point Jones walking track and in the private land on Point Best track some stations using fruit and vegetables and others using flat head frames from the fishing co-op in Lakes Entrance. Steve travels to Boole Poole to monitor free feed stations, two fish stations one located on the eastern end of Point Best track and one on the Point Jones walking track have been fed on by pigs! All other bait stations are undisturbed. Steve is joined by FOGL members David Ellard, Maurice Burns, James Mcdonald and Stuart Dalgleish as well as Yasmine Alley from Parks Vic to undertake an onsite progress report. Fish free feed stations on Point Best track and Point Jones walking track were being fed on by pigs, indications showing 2 to 3 animals. After dropping the visitors back off at Mosquito Point Steve also discovers an additional fish feed station located on Yellow Bay track about 200 metres from the Park boundary is also being fed on. Tracks at this feed station indicate only one animal, most likely a solitary boar. All other feed stations are undisturbed. Steve returns to Boole Poole to monitor feed stations, all three feed stations mentioned previously on Yellow Bay track, Point Best track and Point Jones walking track are still being fed on. No new feed stations being used. Same three feed stations still being fed on. Fish feeding station in the private land on Point Best track being fed on by 2 to 4 animals. There are now three separate groups of pigs feeding on four feed stations with around 5 to 7 animals. Same four feed stations still being fed on. Steve travels to Yarram to undertake Farm Chemical Users Course. 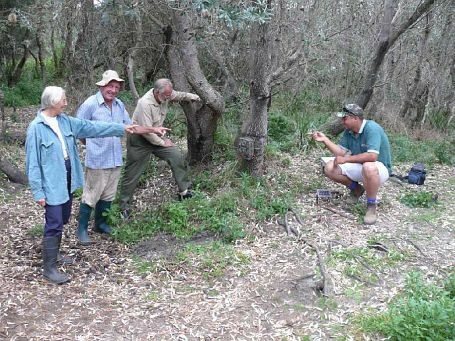 Steve is joined by James Mcdonald to begin setting out pig traps at two active free feeding stations on Yellow Bay track and Point Jones walking track. The two side panels for each trap are dragged out and placed in position next to the free feeding site so the pigs can become used to feeding through the steel structure. Each panel is wired in place with the support of a steel post. This creates a type of door that the pigs need to open to access the fish underneath, when it comes time to set the trap a rod is placed through an eyelet on one of the hinges and the other end through the sliding door on the front of the cage. When a pig turns over the board the trap is set off. Stopped topping up fish at free feed station on Point Best track to encourage this group of pigs to feed only at the trap site on Point Jones walking track. Pigs had not fed on feed station in the private land on Point Best track. Steve and James check traps and find pigs have fed through overnight. Back panels are added to the two traps but are left open at one end. Pigs have still not returned to feed station in private land Point Best track. Pigs feeding through both traps overnight. Steve closes and wires up the rear panels of both traps. Pigs have returned to feed station in private land on Point Best track. Pigs feeding at both trap sites with rear panels on as well as free feed station in private land on Point Best track. Steve adds front panel to both traps, the front panel has a guillotine type sliding gate which has been wired open to allow the pigs to feed through and get used to entering the trap. Trap on Yellow Bay track has hinged treadle mechanism added. Pigs feeding through trap on Point Jones walking track but not on Yellow Bay track. Pigs still feeding at Point Best private free feed station. 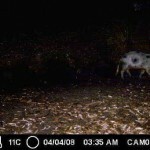 Sightings of pigs in the area over Easter, one large pig and one smaller pig. These are likely to be the same animals feeding at feed station nearby. Anne shows Steve an area of sarcocornia saltmarsh which has been heavily rooted by pigs, some of this sign looks to be overnight. 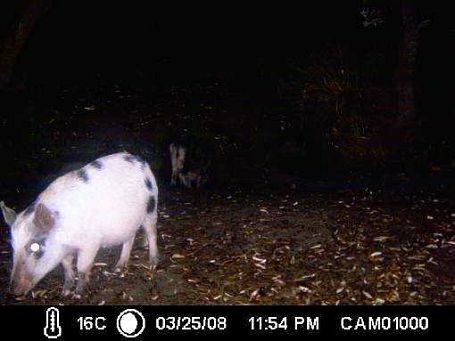 Plans to move trap to feed station on the private land at Point Best track after pigs at Point Jones walking track have been successfully captured. If pig activity still continues after the trap is moved and these animals are trapped then a feed station will be erected at the area of sarcocornia in the Schmidli property. James joins Steve to check feed stations, still no activity at Yellow Bay track while the pigs at Point Jones walking track seem to be happily feeding through the cage. Front panel on trap at Yellow Bay track is swung open again in the hope that the pig will re-commence feeding. Feed station Point Best private land still active. Steve to Omeo to undertake Quoll trapping on the Nunniong plains. David Ellard and James Mcdonald continue with free feeding while Steve is away. 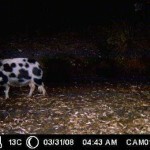 David reports more pig sightings around the Schmidli property at Point Best including more animals than previously sighted. Yellow Bay feed station still not active. Point Best and Point Jones walking tracks still have plenty of activity. Wildlife Unlimited staff Elke Ronacher and Steve Coulson travel to Boole Poole to open traps at Point Best and to establish two free feeding stations at Ellards. Traps are constructed with shade cloth secured over the roof of the trap and a water trough placed in the corner. This will allow for traps to be checked and re-baited every three days allowing for minimum disturbance. The trap located in the boys paddock at Point Best has one set of pig tracks estimated to be around two weeks old inside the trap. This is the only fresh sign at Point Best. Free feed site at Ellards property has some areas of rooting ranging from around three months to two weeks in age. Traps at Point Best are checked and re-baited every three days by Anne Schmidli with no results. Free feed stations at Ellards property are checked and re-baited every three days by David Ellard. One of the two feed stations is being fed on sporadically by pigs and is also being disturbed by foxes. Elke and Steve travel to Ellards property to construct side panels of trap to allow pigs to get used to feeding through the steel structure. (1145hrs) Trap now fully setup and operational with door panel wired open. David Ellard reports continued feeding of pigs at this trap. Tracks at this feed station indicate only one animal. (1400hrs)Trap was active from November 30 up until Christmas with no results and then closed for the holiday break. Steve finds fresh overnight sign outside trap (7.01.08). This is the first sign since traps were opened on the 30.11.2007. Trap now wired open with a leader bait placed outside door and another bait inside trap. (1530hrs) Trap also closed before Christmas after no results since trap was opened on the 30.11.2007. With no fresh sign nearby, trap remains closed. 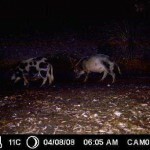 Pig activity around Point Best seems to have ceased after traps were activated in late November 2007. 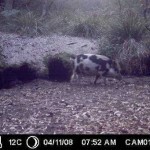 Pigs returned to the area approximately two weeks after the 2 traps (Boat Shed and Boys Paddock) were closed just before Christmas. Some explanations may be that the addition of shade mesh over the trap, or increased activity around the area may have spooked the pigs. David Young (DSE) undertakes some radio tracking around the Yellow Bay area close to where the collared sow was originally trapped and collared. No signal was detected. (1300-1310hrs) Radio tracking was undertaken from a boat in the water between Mosquito Point and Yellow Bay to try to locate collared sow. No signal was detected. A range of frequencies was trialled as it is possible for the frequency of the collar to change over time. Frequencies trialled were between 150.1800 Mhz to 150.2100 Mhz. Original frequency of collar is 150.2000 Mhz. 1. 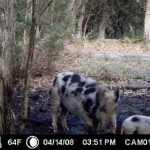 Joe Stephens and Steve Coulson are to undertake radio tracking to locate collared sow on Wednesday or Thursday. Steve is to carry a firearm in the event that the sow is located any other animals associated with her can be destroyed. 2. Steve to activate Ellards trap on Thursday or Friday this week, providing feeding continues. Continued trapping is to be undertaken by FOGL members with the hope of capturing an additional sow to be collared. Any other pigs captured are to be destroyed by Wildlife Unlimited. 1. Continued trapping as described above. 2. 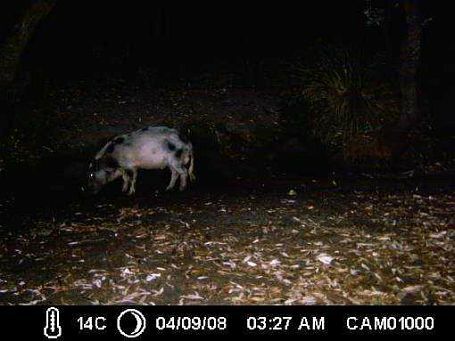 In consultation with Parks Vic oppurtunistic shooting is to be undertaken by Wildlife Unlimited staff at waterholes, feeding areas and any other areas of pig activity. 1. Anne Schmidli reports a sighting of two pigs at a waterhole on the western end of Jubilee Head track just before Christmas. 2. 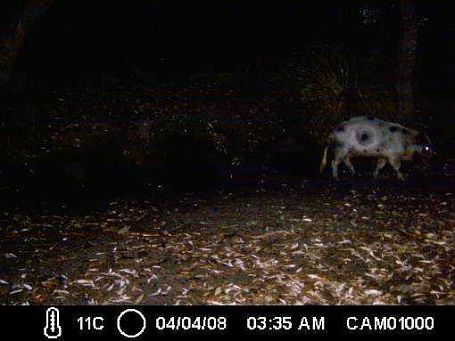 Reports of pig sign at mosquito point from Joe Stephens, possibly just one animal. Joe Stephens and Steve Coulson travel to Boole Poole to undertake radio tracking in the hope of locating the collared sow. After overcoming some minor equipment glitches, a good signal is picked up. With Steve carrying the firearm they set off in the direction of the signal. 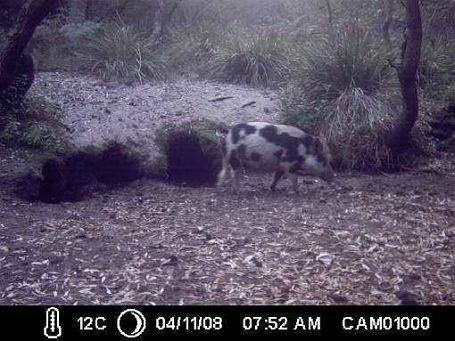 After walking a short distance the pig is located in some long bracken fern about two hundred and fifty metres south of Yellow Bay track, within one kilometre of where she was originally trapped. Steve manages to walk in to within one metre and determine that she is not accompanied by any other animals and shows no signs of having any young. The collar looks to be still attached well and in good order. •	Possible rooting at shipping container at Mosquito Point aging from several weeks to approximately three days to a week old. •	Tracks at a waterhole on Yellow Bay track aged at approximately two to four days old. •	Tracks at a waterhole on Point Best track aged at approximately one to three days old. •	Rooting on salt marsh on Round Head track aged between approximately three weeks and two days old. •	All sign indicated only one or two animals at each site. David Ellard reports returned pig activity at trap after having been quiet since the trap was completely erected on the 7.1.08. David reports that the boards covering the bait have been tossed aside with vigour indicating that it is more likely pigs and not foxes. There were also a lot of tracks in the sand but they could not be identified due to the sand being very soft and dry. Tracks are half filled in as soon as they are formed. Steve activates trap. No more activity has been reported since. After Steve wired trap open on the 7.1.08 Anne reports rooting nearby trap but no feeding up until the 16.1.08 when all the fish is taken, Anne sets the trap. On the 18th at 1230 hrs Steve receives a phone call from Anne to say a pig has been captured! After Jim returns from Melbourne in the evening Steve and Jim travel to Schmidli’s arriving at Point Best at around 2000 hrs. After creeping closer they discover a medium to large size boar in the trap. The boar is dispatched and the carcass dragged to the scrub line opposite the track in the hope of attracting other pigs in the area to the trap site. The trap is reset by Anne the following day. Well done to Anne and John for all their hard work baiting and monitoring the trap. Steve re-opens trap to trial a new lure that Jim has heard about from a contact in North Queensland. This involves the use of sump oil which the pigs apparently can not resist wallowing and rolling in. Four layers of heavy plastic sheet are laid on the ground in one corner of the trap to stop any oil soaking through into the ground. This is then covered with a thick layer of sand to cover the plastic and mask any noise caused by pigs rolling on the plastic sheet. Finally sump oil is poured over the sand. Steve will monitor this trap to see if it is an attractant to pigs and if so fish will be added and the trap set. No radio tracking has been conducted since Joe and Steve located the Sow. 1. Continued trapping is to be undertaken by FOGL members with the hope of capturing an additional sow to be collared. Any other pigs captured are to be destroyed by Wildlife Unlimited. 2. Sand pads to be added outside the door of the traps so size and number of pigs or other species visiting traps can be determined. No other sightings or sign have been reported recently. The traps have been quiet during this period. Ann reports some fresh evidence of pigs rooting in the saltmarsh in the Boys Paddock but so far they have displayed little interest in that trap. Ellards trap is still closed and awaiting relocation and there is no current news on the Boat Shed trap. Steve and Jim take two remote cameras belonging to PV to Boole Poole on 16.03.08. 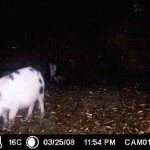 This is the first time we have had access to cameras for this project although they have been used to photograph pigs on Boole Poole in the past. They are installed at the western end. One camera is installed at the Boys Paddock trap on the old trap structure. It is focused on the doorway of the new functioning trap. 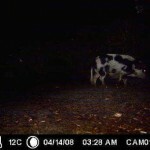 The idea with this camera is to observe the pig behaviour near the traps. We are keen to know whether they are visiting the traps but not entering or whether they are just not interested in the traps at the moment. 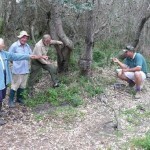 The second camera was attached to a tree at the Curtis waterhole. Frank kindly led us in to the waterhole which is off the beaten track. It is really old wombat burrows or excavation filled with water. 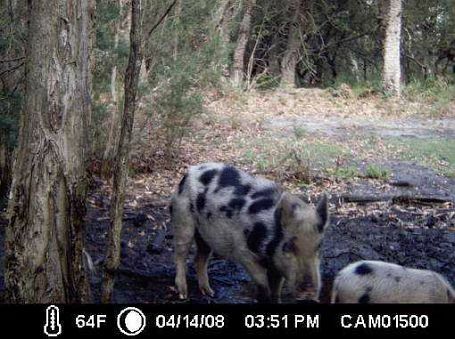 This camera was installed to see if pigs were coming in to this waterhole to drink. After seven nights the Boys Paddock trap camera has to be removed by Joe Stephens (PV) for another commitment on long weekend in March. Photos taken between the day of installation and removal showed only Deer activity around the trap. Joe Stephens and Steve Coulson plan to travel to Boole Poole to undertake radio tracking to locate the collared sow (maybe in week April 7-11), sedate her and transport her up to the western end of Boole Poole. She appears to be a solitary animal in the current location so by moving her we hope she will join with the other resident animals and play her proper role as a Judas animal. 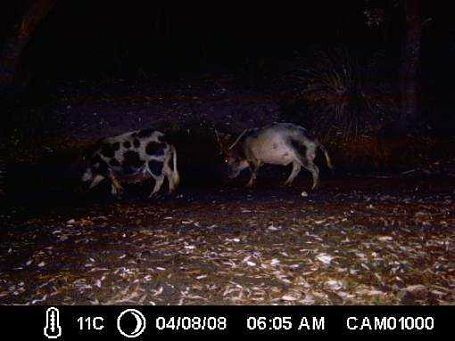 Using the PV cameras to detect pig movements and behaviours at waterholes so that they can be intercepted or traps relocated to active sites. Investigate the McGaskill property is still a task. LIAISE WITH PV REGARDING THE NEW 1080 PIG BAIT NOW ON THE MARKET. Pig-out maybe something that we can present to the pigs that will not be available to non-target species such as deer and macropods (a heavy pellet bait that could be buried in similar fashion to the fish baits in the traps). 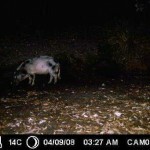 Ann reports that deer hunters recently on her property did have a pig sighting but there are no details as yet. Steve and Jim travel to Boole Poole to locate the collared sow. There is no sign or signal at the site where Joe Stephens and Steve found her a week ago. Steve and Jim walk along the high sand ridge past where she has been living but still no signal. Deep pig rootings in the sand for approximately 500m. Amazing to see how much damage a single pig can do. Some of the sign was fresh(ish) so she must not be far away. Next strategy is to drive and stop every 300m approx and listen and continue this right around the block where she has been living and then back along the Yellow Bay Tk to the Jubilee Head Tk. No luck with that. She is probably not far away but in what direction is impossible to tell. Steve travels to Boole Poole, sits on Pt Best Dam for 1 hr then visits the Boys Paddock on Anne’s property. Is successful in destroying (shooting) adult sow and one small piglet. One other piglet escapes. 20.04.08 Steve and Jim travel to Boole Poole. Sit on 2 waterholes in the PM, no luck. Recce the Boys Paddock but do not encounter any further pigs. The Pt Best camera has been removed by persons unknown*. Report back to Joe Stephens. *Edit: Camera was removed by DSE Fire people as it was thought it would be in the area scheduled for burning. 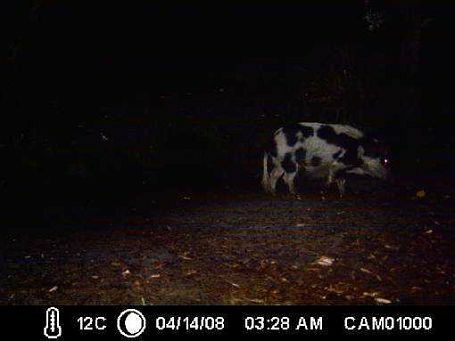 Good Data from cameras as to pig visitation at dams will allow us to target these dams and arrive at times when pigs most likely to be encountered. Can also start to identify individual pigs and know a bit about their distribution and abundance. Dave McGaskill happy for us to investigate his dam so will look at moving camera if suitable.